Trese Brothers seem to fancy expanding the Star Traders universe these days. It all started with Star Traders RPG, which was then joined by Star Traders 4X Empires. Now, just in time for the saga’s fourth anniversary… they’re kickstarting Star Traders 2 RPG! Great time to be a strategy fan, I’d say. From the looks of it, Star Traders 2 RPG doesn’t seem to be your typical sequel either, with but a few things tweaked and/or expanded upon. Almost the opposite, actually, with things like crew morale being an actual thing this time around, leading to plenty of interesting plot elements and drama, I’m sure. On top of that, there’s also ship-to-ship combat, as well as actual boarding! After all, what’s a captain who’s unwilling to stand with his men on the frontlines? Exactly. If the heart of the ship is your crew then the muscle and bones are your Star Trader vessel. With every map being procedurally generated, you’ll never know what lies around the corner (or in the next quadrant, for that matter). Because of this, players will likely have to make tough split-second decisions, turn-based gameplay or not. Combat isn’t always the best option, and in this particular game, diplomacy and politics also weighs rather heavily. All depends on how your world is shaped, and of course, the choices you make along the way. Those are just some what we can expect from upcoming Star Traders 2 RPG, and along with the whole crowdfunding thing, its Kickstarter page also plays host to a wealth of additional details. Exactly when the game will make the leap from WIP to a finalized product remains to be seen, although I hear September 2015 is the current window. That said, I’m sure the motivation to put in more hours to get it done ASAP will be boosted by a successful Kickstarter campaign, so let’s look at what’s what. Old tensions and distrust fan the flames of conflict and political rivalries make unification impossible. While the Factions vie for influence and control, the Star Trader Captains see opportunities on the new shipping routes and in vast reaches of uncharted space. With $7,822 of $50,000 pledged and 32 days on the clock, they’re off to a good start already. Likely in no small part due some interesting backer tiers, which include a $5 ‘early bird special’, a $9 ‘mid-morning bird special’, and of course, the ‘pre-order’, priced at $10. What? Oh right, the interesting ones! Well, alpha access will set you back $50, while doubling that amount lets you become part of the Star Traders 2 RPG lore. Lovely, eh? Now, as far as the ‘why’ part goes: they’re basically looking to ensure that the game will be a huge step up from previous Star Traders titles; “instead of only taking another incremental step forward”. Sounds valid enough, and since they’ve self-funded five games (sixth being Heroes of Steel), it’s not like we’re dealing with a case of ‘first concept, first game, give me money’ here. Being an established developer is important when reaching out to the public – fans and newcomers alike – for financial support, after all. 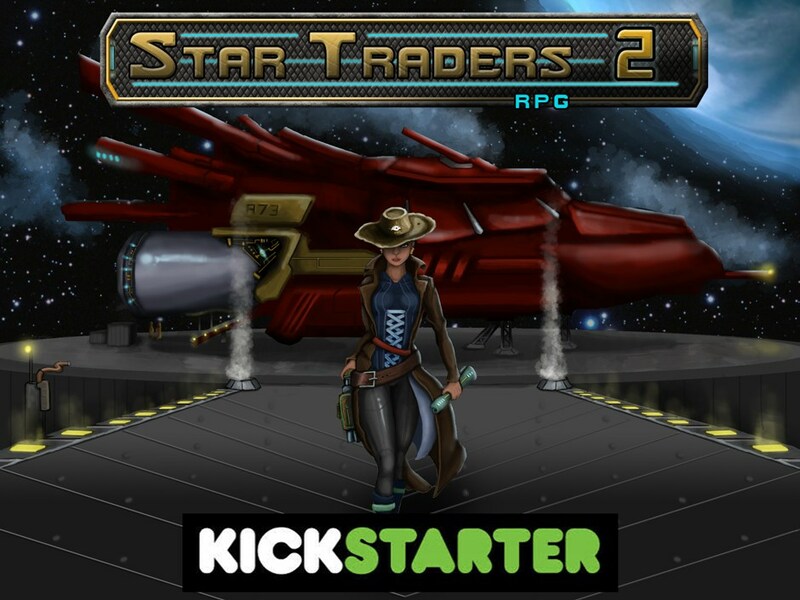 So… let’s get Star Traders 2 RPG kickstarted, eh? Star Traders 2 RPG KickStarter is Live!